Humans throughout history and in many cultures have ascribed symbolic meaning to trees. The writer of Genesis tells us of trees in the Garden of Eden; among them the tree of life: “And out of the ground the Lord made to grow every tree that is pleasant to the sight and good for food, the tree of life also in the midst of the garden, and the tree of good and evil.” (Gen. 2:9). The tree of life is mentioned again in Revelation with a note that it bears twelve types of fruit and that its leaves are for the healing of nations (Rev. 22:1-2). Like trees we come into the world, grow according to our genetic plan, and encounter a world that may be both supportive and threatening. Klimt did not comment on any of his work but a variety of influences may be seen; these include motifs from sources such as Byzantine mosaics, and the arts of Egypt and Asia. 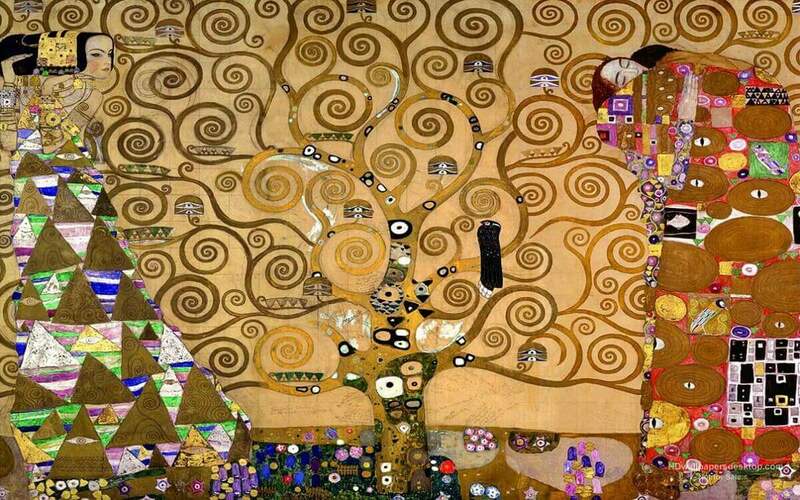 Klimt’s “Tree of Life,” has its roots in a colorful mosaic-like soil suggesting earthly attractions that are there to be tapped. Its thick trunk spreads out into tendrils that fill the painting with Fibonacci spirals; spirals are known to represent the sun as well as the cycle of seasons and the cycles of life. Interspersed among the branches of the tree are rounded eye-like orbs and the eye(s) of Horus. A raven is waiting. Standing on the left side of the painting is a youthful woman who is facing life and projecting her thoughts with the hope that her future will be fulfilled (symbolized by an embrace on the right side of the painting). Based on the images in “The Tree of Life,” we can surmise Klimt is saying this young woman’s experiences – and what she makes of them – will affect her journey as life unfolds. The spiraling branches suggest growth, progression, and life’s complexities. There will be earthly pleasures and watchful eyes; the Egyptian healing Eye of Horus is included several times among them. Yet death symbolized by a raven is perched on a branch and will be part of the journey as well. Experiences await us as we enter the labyrinth of branches life places before us. We make choices as we continue with hope. We often see the familiar Rx symbol displayed at pharmacies (the “R” is made with an extended leg that is crossed to make the “x”). Persuasive evidence suggests this symbol is derived from the Eye of Horus. Ancient Egyptians were known to wear amulets of the Eye of Horus in the belief it would help ensure good health.